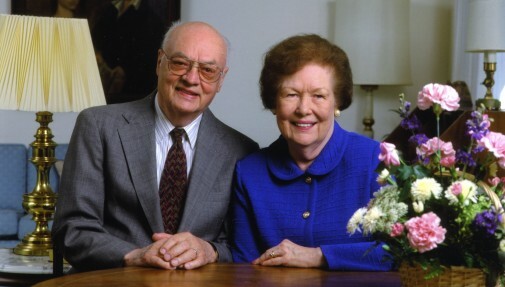 Roger and Margaret Jacobsen Voskuyl. Photo courtesy of the Westmont Archives. 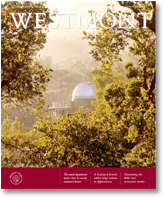 One of Westmont’s first faculty members has died. Margaret Jacobsen Voskuyl passed away March 15 in Santa Barbara at the age of 94. 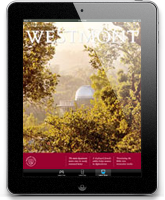 Gracious, energetic, smart and articulate, she enthusiastically embraced the vision of Westmont’s founders. Margaret’s long history with the college began in 1940. After earning bachelor’s and master’s degrees in Christian education at Wheaton College, she arrived at Westmont with Wallace Emerson, the former dean of students at Wheaton who became the first president. Margaret taught English from 1940-41, lived in one of the dormitories and served as assistant dean of women. She left to marry Rolf Jacobsen in 1941, who was a Westmont trustee from 1947 until his death in 1974. Their Pasadena home overlooked the Rose Bowl, and Margaret lived there for 47 years. She raised three children and joined the faculty at Biola from 1949 to 1957 at the invitation of Emerson, who worked there after poor health forced him to resign from Westmont. Margaret taught psychology and Christian education and published a book on child psychology. She also wrote for Christian Life and Times. A longtime member of Lake Avenue Congregational Church in Pasadena, she taught Sunday school and served as superintendent of missions there for 28 years. During her travels, she often visited missionaries the church supported. A founding member of the Association of Church Missions Committees, she led effectively in the male-dominated world of her day. Rolf and Margaret were business partners involved with the Pasadena Central Improvement Association, which first envisioned Old Town Pasadena. When he died, Margaret ably managed his business enterprises. In 1986, she married former Westmont president Roger Voskuyl, and they moved to Santa Barbara in 1997. Together, they enjoyed 19 years of retirement and worldwide travel. He died in 2005.